Earn credit and gain international work experience at the same time. For centuries, France has inspired the imagination of those who value learning, culture and enlightenment. No single city represents this more than Paris, the "city of light." It has drawn countless seekers from abroad, Madame Curie, Jean-Jacques Rousseau, Chopin, Samuel Beckett, Hemingway, to name a few. The rich intellectual and artistic history of Paris touches the visitor at every step. To have lived in Paris, even for a semester, is to have in some small way been a part of its great legacy to Western civilization. 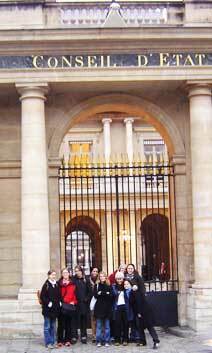 ELI's program in Paris is a unique combination of international work experience and rigorous academics. Students spend the first five weeks of this program in a classroom setting and then begin working in the field of their choice and preparing a final research project. ELI and our partners in France customize internships to suit the needs of the host business or organization as well as the student. To participate in this program students need to have at least four semesters of college level French language or equivalent. See our application requirements pages for details.